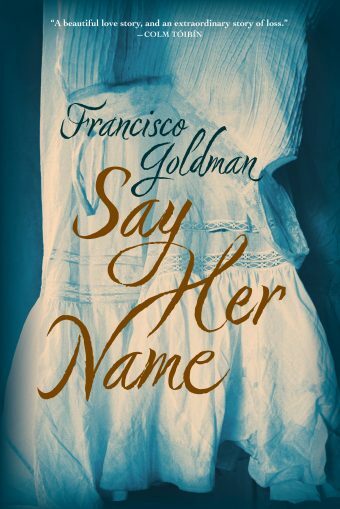 Celebrated novelist Francisco Goldman married a beautiful young writer named Aura Estrada in a romantic Mexican hacienda in the summer of 2005. The month before their second anniversary, during a long-awaited holiday, Aura broke her neck while body surfing. 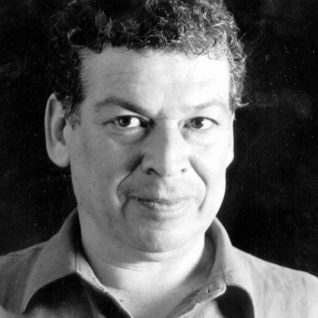 Francisco, blamed for Aura’s death by her family and blaming himself, wanted to die, too. But instead he wrote Say Her Name, a novel chronicling his great love and unspeakable loss, tracking the stages of grief when pure love gives way to bottomless pain. 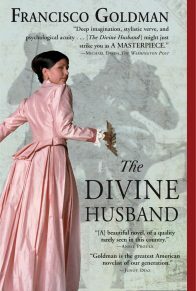 Suddenly a widower, Goldman collects everything he can about his wife, hungry to keep Aura alive with every memory. 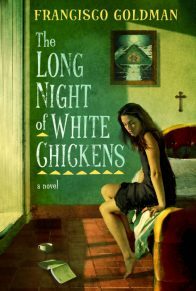 From her childhood and university days in Mexico City with her fiercely devoted mother to her studies at Columbia University, through their newlywed years in New York City and travels to Mexico and Europe—and always through the prism of her gifted writings—Goldman seeks her essence and grieves her loss. Humor leavens the pain as he lives through the madness of utter grief and creates a living portrait of a love as joyous and playful as it is deep and profound. Say Her Name is a love story, a bold inquiry into destiny and accountability, and a tribute to Aura, who she was and who she would have been. 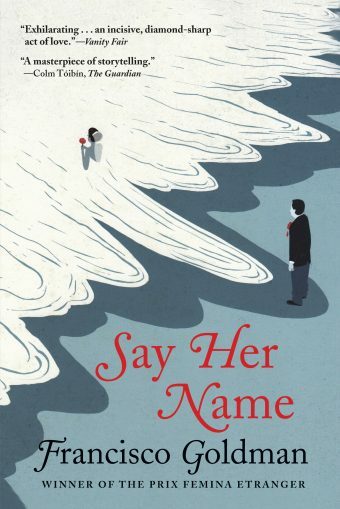 Read the extraordinary piece adapted from Say Her Name in The New Yorker. 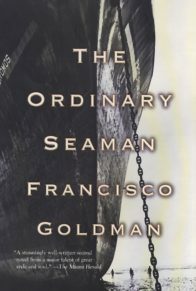 “Francisco Goldman’s intimate and elegiac tribute to his late wife initially reads like the latest entry in a long list of tragic love stories starting with Orpheus and Eurydice. That alone would suffice to make this a compelling read. But Goldman goes further . 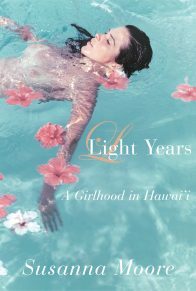 “This book lingers in the spell of love, drawing it out, savoring each note, each dissonance, its mystical strangeness . .
Aura died on July 25, 2007. I went back to Mexico for the first anniversary because I wanted to be where it had happened, at that beach on the Pacific coast. Now, for the second time in a year, I’d come home again to Brooklyn without her. Three months before she died, April 24, Aura had turned thirty. We’d been married twenty-six days shy of two years. Aura’s mother and uncle accused me of being responsible for her death. It’s not as if I consider myself not guilty. If I were Juanita, I know I would have wanted to put me in prison, too. Though not for the reasons she and her brother gave. 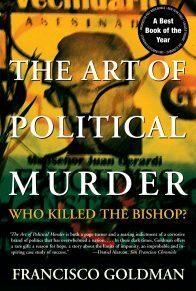 From now on, if you have anything to say to me, put it in writing—that’s what Leopoldo, Aura’s uncle, said on the telephone when he told me that he was acting as Aura’s mother’s attorney in the case against me. We haven’t spoken since. A love-hate triangle, or, I don’t know. Mi amor, is this really happening? Whenever Aura took leave of her mother, whether at the Mexico City airport or if she was just leaving her mother’s apartment at night, or even when they were parting after a meal in a restaurant, her mother would lift her hand to make the sign of the cross over her and whisper a little prayer asking the Virgin of Guadalupe to protect her daughter. Axolotls are a species of salamander that never metamorphose out of the larval state, something like pollywogs that never become frogs. They used to be abundant in the lakes around the ancient city of Mexico, and were a favorite food of the Aztecs. Until recently, axolotls were said to be still living in the brackish canals of Xochimilco; in reality they’re practically extinct even there. They survive in aquariums, laboratories, and zoos. Aura loved the Julio Cortézar short story about a man who becomes so mesmerized by the axolotls in the Jardin des Plantes in Paris that he turns into an axolotl. Every day, sometimes even three times a day, the nameless man in that story visits the Jardin des Plantes to stare at the strange little animals in their cramped aquarium, at their translucent milky bodies and delicate lizard’s tails, their pink fl at triangular Aztec faces and tiny feet with nearly humanlike fingers, the odd reddish sprigs that sprout from their gills, the golden glow of their eyes, the way they hardly ever move, only now and then twitching their gills, or abruptly swimming with a single undulation of their bodies. They seem so alien that he becomes convinced they’re not just animals, that they bear some mysterious relation to him, are mutely enslaved inside their bodies yet somehow, with their pulsing golden eyes, are begging him to save them. One day the man is staring at the axolotls as usual, his face close to the outside of the tank, but in the middle of that same sentence, the “I” is now on the inside of the tank, staring through the glass at the man, the transition happens just like that. The story ends with the axolotl hoping that he’s succeeded in communicating something to the man, in bridging their silent solitudes, and that the reason the man no longer visits the aquarium is because he’s off somewhere writing a story about what it is to be an axolotl. The first time Aura and I went to Paris together, about five months after she’d moved in with me, she wanted to go to the Jardin des Plantes to see Cortázar’s axolotls more than she wanted to do anything else. She’d been to Paris before, but had only recently discovered Cortázar’s story. You would have thought that the only reason we’d fl own to Paris was to see the axolotls, though actually Aura had an interview at the Sorbonne, because she was considering transferring from Columbia. Our very first afternoon, we went to the Jardin des Plantes, and paid to enter its small nineteenth century zoo. In front of the entrance to the amphibian house, or vivarium, there was a mounted poster with information in French about amphibians and endangered species, illustrated with an image of a red-gilled axolotl in profile, its happy extraterrestrial’s face and albino monkey arms and hands. Inside, the tanks ran in a row around the room, smallish illuminated rectangles set into the wall, each framing a somewhat different humid habitat: moss, ferns, rocks, tree branches, pools of water. We went from tank to tank, reading the placards: various species of salamanders, newts, frogs, but no axolotls. We circled the room again, in case we’d somehow missed them. Finally Aura went up to the guard, a middle-aged man in uniform, and asked where the axolotls were. He didn’t know anything about the axolotls, but something in Aura’s expression seemed to give him pause, and he asked her to wait; he left the room and a moment later came back with a woman, somewhat younger than him, wearing a blue lab coat. She and Aura spoke quietly, in French, so I couldn’t understand what they were saying, but the woman’s expression was lively and kind. When we went outside, Aura stood there for a moment with a quietly stunned expression. Then she told me that the woman remembered the axolotls; she’d even said that she missed them. But they’d been taken away a few years before and were now in some university laboratory. Aura was in her charcoal gray woolen coat, a whitish wool scarf wrapped around her neck, strands of her straight black hair mussed around her soft round cheeks, which were flushed as if burning with cold, though it wasn’t particularly cold. Tears, just a few, not a flood, warm salty tears overflowed from Aura’s brimming eyes and slid down her cheeks. Who cries over something like that? I remember thinking. I kissed the tears, breathing in that briny Aura warmth. Whatever it was that so got to Aura about the axolotls not being there seemed part of the same mystery that the axolotl at the end of Cortázar’s story hopes the man will reveal by writing a story. I always wished that I could know what it was like to be Aura. Où sont les axolotls? she wrote in her notebook. Where are they? Aura moved in with me in Brooklyn about six weeks after she’d arrived in New York from Mexico City with her multiple scholarships, including a Fulbright and another from the Mexican government, to begin studying for a PhD in Spanish-language literature at Columbia. We lived together almost four years. At Columbia she shared her university housing with another foreign student, a Korean girl, a botanist of some highly specialized kind. I saw that apartment only two or three times before I moved Aura’s things to my place. It was a railroad flat, with a long narrow hallway, two bedrooms, a living room at the front. A student apartment, filled with student things: her Ikea bookcase, a set of charcoal-hued nonstick pots and pans and utensils, a red beanbag chair, a stereo unit, a small toolbox, from Ikea too, still sealed in its clear plastic wrapper. Her mattress on the floor, clothing heaped all over it. That apartment made me feel nostalgic as hell—for college days, youth. I was dying to make love to her then and there, in the sumptuous mess of that bed, but she was nervous about her roommate coming in, so we didn’t. I took her away from that apartment, leaving her roommate, whom Aura got along with fine, on her own. But a month or so later, once she felt sure that she was going to stay with me, Aura found another student to take her share, a Russian girl who seemed like someone the Korean girl would like. Up there, on Amsterdam Avenue and 119th Street, Aura lived at the edge of campus. In Brooklyn, she had to ride the subway at least one hour each way to get to Columbia, usually during rush hour, and she went almost every day. She could take the F train, transfer at Fourteenth Street and make her way through a maze of stairways and long tunnels, grim and freezing in winter, to the 2 and 3 express trains, and switch to the local at Ninety-sixth Street. Or she could walk twenty-five minutes from our apartment to Borough Hall and catch the 2 or 3 there. Eventually she decided she preferred the second option, and that was what she did almost every day. In winter the trek could be brutally cold, especially in the thin wool coats she wore, until finally I convinced her to let me buy her one of those hooded North Face down coats, swaddling her from the top of the head to below the knees in goose down—puffed blue nylon. No, mi amor, it doesn’t make you look fat, not you in particular, everybody looks like a walking sleeping bag in one of those, and who cares anyway? Isn’t it better to be snug and warm? When she wore the coat with the hood up, collar closed under her chin, with her gleaming black eyes, she looked like a little Iroquois girl walking around inside her own papoose, and she hardly ever went out into the cold without it. Another complication of the long commute was that she regularly got lost. She’d absentmindedly miss her stop or else take the train in the wrong direction and, engrossed in her book, her thoughts, her iPod, wouldn’t notice until she was deep into Brooklyn. Then she’d call from a pay phone in some subway station I’d never heard of, Hola, mi amor, well, here I am in the Beverly Road Station, I went the wrong way again—her voice determinedly matter-of-fact, no big deal, just another over-scheduled New Yorker coping with a routine dilemma of city life, but sounding a touch defeated anyhow. She didn’t like being teased about going the wrong way on the subway, or getting lost even when she was walking in our own neighborhood, but sometimes I couldn’t help it. From Aura’s first day in our Brooklyn apartment to nearly her last, I walked her to the subway stop every morning—except on those mornings when she rode her bicycle to Borough Hall and left it locked there, though that routine didn’t last long because the homeless drunks and junkies of downtown Brooklyn kept stealing her bike seat, or when it was raining or when she was just running so behind that she took a taxi to Borough Hall, or on the rare occasion when she flew out the door like a furious little tornado because it was getting late and I was still stuck on the can yelling for her to wait, and the two or three times when she was just so pissed off at me about something or other that she absolutely didn’t want me to walk with her. Francisco, I didn’t get married to eat lunch by myself. I didn’t get married to spend time by myself. On those morning walks to the subway, Aura always did most or even all of the talking, about her classes, professors, other students, about some new idea for a short story or novel, or about her mother. Even when she was being especially neuras, going on about her regular anxieties, I’d try to come up with new encouragements or else rephrase or repeat prior ones. But I especially loved it when she was in the mood to stop every few steps and kiss and nip at my lips like a baby tiger, and her mimed silent laughter after my ouch, and the way she’d complain, “Ya no me quieres, verdad?” If I wasn’t holding her hand or didn’t have my arm around her the instant she wanted me to. I loved our ritual except when I didn’t really love it, when I’d worry, How am I ever going to get another damned book written with this woman who makes me walk her to the subway every morning and cajoles me into coming up to Columbia to have lunch with her? I still regularly imagine that Aura is beside me on the sidewalk. Sometimes I imagine I’m holding her hand, and walk with my arm held out by my side a little. Nobody is surprised to see people talking to themselves in the street anymore, assuming that they must be speaking into some Bluetooth device. But people do stare when they notice that your eyes are red and wet, your lips twisted into a sobbing grimace. I wonder what they think they are seeing and what they imagine has caused the weeping. On the surface, a window has briefly, alarmingly, opened. One day that first fall after Aura’s death, in Brooklyn, on the corner of Smith and Union, I noticed an old lady standing on the opposite corner, waiting to cross the street, a normal-looking old lady from the neighborhood, neat gray hair, a little hunched, a sweet jowly expression on her pale face, looking as if she were enjoying the sunlight and October weather as she waited patiently for the light to change. The thought was like a silent bomb: Aura will never find out about being old, she’ll never get to look back on her own long life. That was all it took, thinking about the unfairness of that and about the lovely and accomplished old lady Aura had surely been destined to become. Destined. Was I destined to have come into Aura’s life when I did, or did I intrude where I didn’t belong and disrupt its predestined path? Was Aura supposed to have married someone else, maybe some other Columbia student, that guy studying a few seats away from her in Butler Library or the one in the Hungarian Pastry Shop who couldn’t stop shyly peeking at her? How can anything other than what happened be accurately described as destined? What about her own free will, her own responsibility for her choices? When the light changed and I crossed Smith Street, did that old lady notice my face as we passed? I don’t know. My blurred gaze was fixed on the pavement and I wanted to be back inside our apartment. Aura was more present there than she was anywhere else. The apartment, which I’d been renting for eight years by then, was the parlor floor of a four-story brownstone. Back when the Rizzitanos, the Italian family that still owned the building, used to live there, occupying all four floors, the parlor would have been their living room. But it was our bedroom. It had such tall ceilings that to change a lightbulb in the hanging lamp I’d climb a five-foot stepladder, stand on tiptoes atop its rickety pinnacle and reach up as high as I could, though still end up bent over, arms flapping, fighting for balance—Aura, watching from her desk in the corner, said, You look like an amateur bird. Around the tops of the walls ran a plaster cornice, whitewashed like the walls, a neoclassical row of repeating rosettes atop a wider one of curled fronds. Two long windows, with deep sills and curtains, faced the street, and between the windows, rising from floor to ceiling like a chimney, was the apartment’s gaudiest feature: an immense mirror in a baroque, goldpainted wooden frame. Now Aura’s wedding dress partly covered the mirror, hung from a clothes hanger and butcher twine that I’d tied around gilded curlicues on opposite sides at the top. And on the marble shelf at the foot of the mirror was an altar made up of some of Aura’s belongings. When I came back from Mexico that first time, six weeks after Aura’s death, Valentina, who studied with Aura at Columbia, and their friend Adele Ramírez, who was visiting from Mexico and staying with Valentina, came to pick me up at Newark Airport in Valentina’s investment-banker husband’s BMW station wagon. I had five suitcases: two of my own and three filled with Aura’s things, not just her clothes—I’d refused to throw or give away almost anything of hers—but also some of her books and photos, and a short lifetime’s worth of her diaries, notebooks, and loose papers. I’m sure that if that day some of my guy friends had come for me at the airport instead, and we’d walked into our apartment, it would have been much different, probably we would have taken a disbelieving look around and said, Let’s go to a bar. But I’d hardly finished bringing in the suitcases before Valentina and Adele went to work building the altar. They dashed around the apartment as if they knew where everything was better than I did, choosing and carrying treasures back, occasionally asking for my opinion or suggestion. Adele, a visual artist, crouched over the marble shelf at the foot of the mirror, arranging: the denim hat with a cloth flower stitched onto it that Aura bought during our trip to Hong Kong; the green canvas satchel she brought to the beach that last day, with everything inside it just as she’d left it, her wallet, her sunglasses, and the two slender books she was reading (Bruno Schulz and Silvina Ocampo); her hairbrush, long strands of black hair snagged in the bristles; the cardboard tube of Chinese pick-up sticks she bought in the mall near our apartment in Mexico City and took into the T.G.I. Fridays there, where we sat drinking tequila and playing pick-up sticks two weeks before she died; a copy of the Boston Review, where her last published essay in English had appeared early that last summer; her favorite (and only) pair of Marc Jacobs shoes; her little turquoise drinking fl ask; a few other trinkets, souvenirs, adornments; photographs; candles; and standing empty on the floor at the foot of the altar, her shiny mod black-and-white-striped rubber rain boots with the hot pink soles. Valentina, standing before the towering mirror, announced: I know! Where’s Aura’s wedding dress? I went and got the wedding dress out of the closet, and the stepladder. It was just the kind of thing Aura and I made fun of: a folkloric Mexican altar in a grad student’s apartment as a manifestation of corny identity politics. But it felt like the right thing to do now, and throughout that first year of Aura’s death and after, the wedding dress remained. I regularly bought flowers to put in the vase on the floor, and lit candles, and bought new candles to replace the burned-out ones. The wedding dress was made for Aura by a Mexican fashion designer who owned a boutique on Smith Street. We’d become friendly with the owner, Zoila, who was originally from Mexicali. In her store we’d talk about the authentic taco stand we were going to open someday to make money off the drunk, hungry, young people pouring out of the Smith Street bars at night, all three of us pretending that we were really serious about joining in this promising business venture. Then Aura discovered that Zoila’s custom-tailored bridal dresses were recommended on the Web site Daily Candy as a thrifty alternative to the likes of Vera Wang. Aura went to Zoila’s studio, in a loft in downtown Brooklyn, for three or four fittings, and she came home from each feeling more anxious than before. She was, at first, after she went to pick up the finished dress, disappointed in it, finding it more simple than she’d imagined it was going to be, and not much different from some of the ordinary dresses Zoila sold in her store for a quarter of the price. It was an almost minimalist version of a Mexican country girl’s dress, made of fine white cotton, with simple embellishments of silk and lace embroidery, and it widened into ruffles at the bottom. But in the end, Aura decided that she liked the dress. Maybe it just needed to be in its rightful habitat, the near-desert setting of the Catholic shrine village of Atotonilco, amid an old mission church and cactus and scrub and the green oasis grounds of the restored hacienda that we’d rented for the wedding, beneath the vivid blue and then yellow-gray immensity of the Mexican sky and the turbulent cloud herds coming and going across it. Maybe that was the genius of Zoila’s design for Aura’s dress. A sort of freeze-dried dress, seemingly plain as tissue paper, that shimmered to life in the charged thin air of the high plains of central Mexico. A perfect dress for a Mexican country wedding in August, a girlhood dream of a wedding dress after all. Now the dress was slightly yellowed, the shoulder straps darkened by salty perspiration, and one of the bands of lace running around the dress lower down, above where it widened out, was partly ripped from the fabric, a tear like a bullet hole, and the hem was discolored and torn from having been dragged through mud and danced on and stepped on during the long night into dawn of our wedding party, when Aura had taken off her wedding shoes and slipped into the dancing shoes we’d bought at a bridal shop in Mexico City, which were like a cross between white nurse shoes and seventies disco platform sneakers. A delicate relic, that wedding dress. At night, backed by the mirror’s illusion of depth and the reflected glow of candles and lamps, the baroque frame like a golden corona around it, the dress looks like it’s floating. Despite the altar, or maybe partly because of it, our cleaning lady quit. Flor, from Oaxaca, now raising three children in Spanish Harlem, who came to clean once every two weeks, said it made her too sad to be in our apartment. The one time Flor did come, I watched her kneel to pray at the altar, watched her pick up photographs of Aura and press them to her lips, smudging them with her emphatic kisses and tears. She imitated Aura’s reliable words of praise for her work, the happy pitch of her voice: Oh Flor, it’s as if you work miracles! Ay, señor, said Flor. She was always so happy, so full of life, so young, so good, she always asked after my children. How could she do her job now, in that way that had always so pleased Aura, Flor pleadingly asked me, if she couldn’t stop crying? Then she’d taken her sadness and tears home with her, home to her children, she explained later when she phoned, and that wasn’t right, no señor, she couldn’t do it anymore, she was sorry but she had to quit. I didn’t bother to look for a new cleaning lady. I suppose I thought she would feel sorry for me and come back. I tried phoning, finally, to beg her to come back, and got a recorded message that the number was no longer in service. Then, months after she’d quit, incredibly, she repented and did phone and leave her new telephone number—apparently, she’d moved—on the answering machine. But when I phoned back, it was the wrong number. Probably I’d written it down wrong, I’m a touch dyslexic anyway. Now, fifteen months after Aura’s death, coming home without her again—no one to meet me at the airport this time—I found the apartment exactly as I’d left it in July. The bed was unmade. The first thing I did was open all the windows, letting in the cool, damp October air. Aura’s MacBook was still there, on her desk. I’d be able to pick up where I’d left off, working on, organizing, trying to piece together her stories, essays, poems, her just begun novel, and her unfinished writings, the thousands of fragments, really, that she left in her computer, in her labyrinthine and scattered manner of storing files and documents. I thought I felt ready to immerse myself in that task. In the bedroom there were old dead rose petals, darker than blood, on the floor around the vase in front of the altar, but the vase was empty. In the kitchen, Aura’s plants, despite not having been watered in three months, were still alive. I stuck my finger in the soil of one pot and found it moist. Then I remembered that I’d left a key with the upstairs neighbors, asking them to water Aura’s plants while I was away. I’d only intended to go to Mexico for the first anniversary and stay a month, but I’d stayed three, and they’d kept it up all that time. They’d thrown out the dead roses, which must have begun to rot and smell. And they’d collected my mail in a shopping bag that they had put next to the couch, just inside the apartment door. Love me a lot, my love. No quiero morir. I don’t want to die. That may have been the last full sentence she ever spoke, maybe her very last words. Did that sound self-exculpating? Is this the kind of statement I should prohibit myself from making? Sure, Aura’s plea and invocation of love would play well on any jury’s emotions and sympathies, but I’m not in a courtroom. I need to stand nakedly before the facts; there’s no way to fool this jury that I am facing. It all matters, and it’s all evidence.